Steps to a successful renovation? Pick an awesome color palette and then work with what you’ve got. 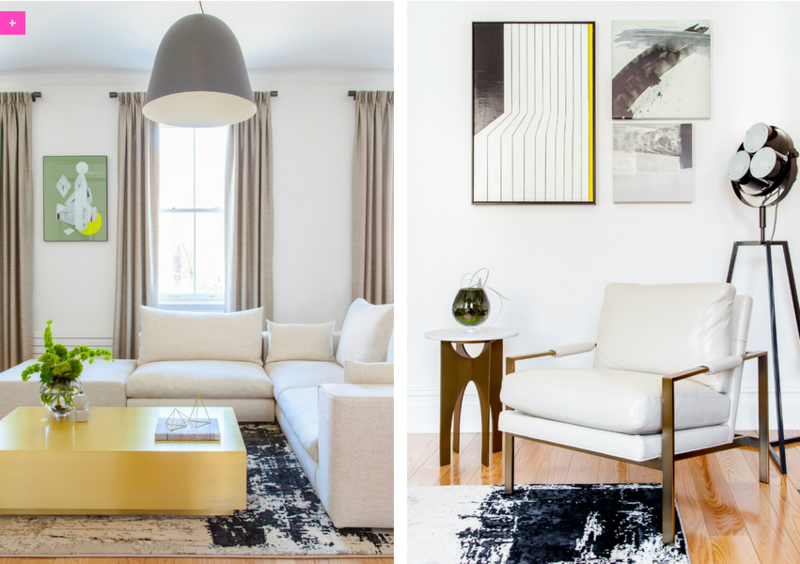 That was the plan behind The New Design Project‘s renovation for this Chelsea duplex. 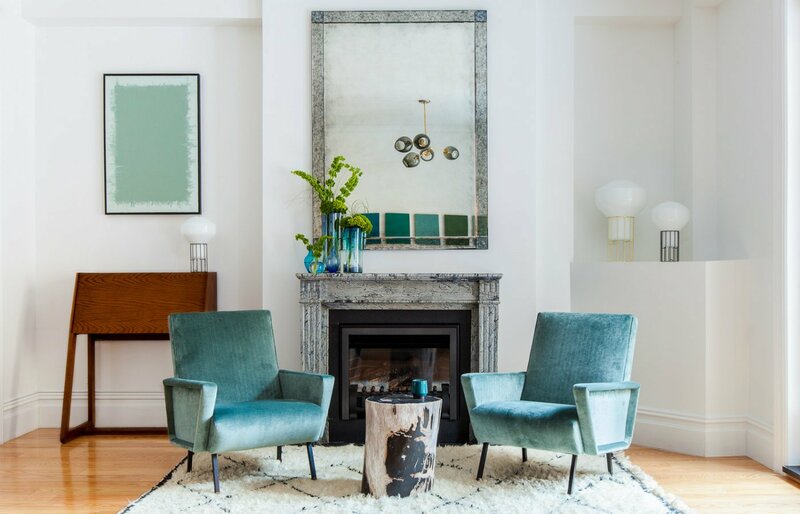 “With a blissful color palette and a seamless mix of statement pieces, graphic artwork and ethnic accessories, this Chelsea duplex apartment oozes sophistication and elegance,” the firm explains. 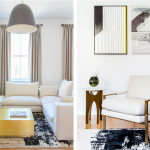 These guys are no strangers to NYC spaces–they perfected a modern aesthetic in this West Village townhouse and this 400-square-foot Uptown apartment. 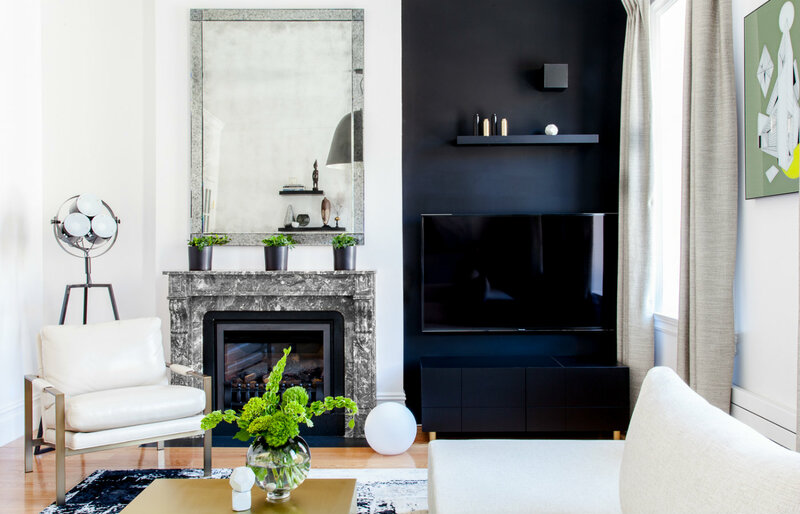 Here, they worked with good apartment bones–high ceilings and natural light–to create a calm, simplified, modern space. 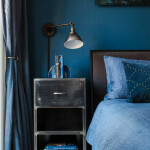 As you can see in the photos, the renovation works with warm and inviting shades of blue. The living room sets the tone for the rest of the apartment, and takes the most advantage of the high ceilings and windows. The New Design Project decided to paint the media wall black to “inject a sense of depth and drama to the space.” The cabinet below, which the firm crafted with DCM Fabrication, has a golden ratio pattern on the front and a brass inlay on the top to echo similar metal accents in the room. The New Design Project also crafted the brass coffee table in the living room. More details of the living room space: The blue tones are offset by a creamy-white sectional and chairs. 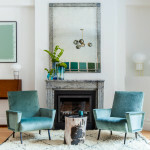 The apartment owner’s existing accessories served as an inspiration, not a hindrance, to the design. 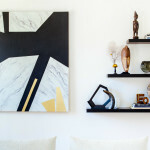 The custom artwork is made from sheets of marble, black and brass laminate. 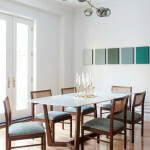 The dining room plays with tones of green and blue. 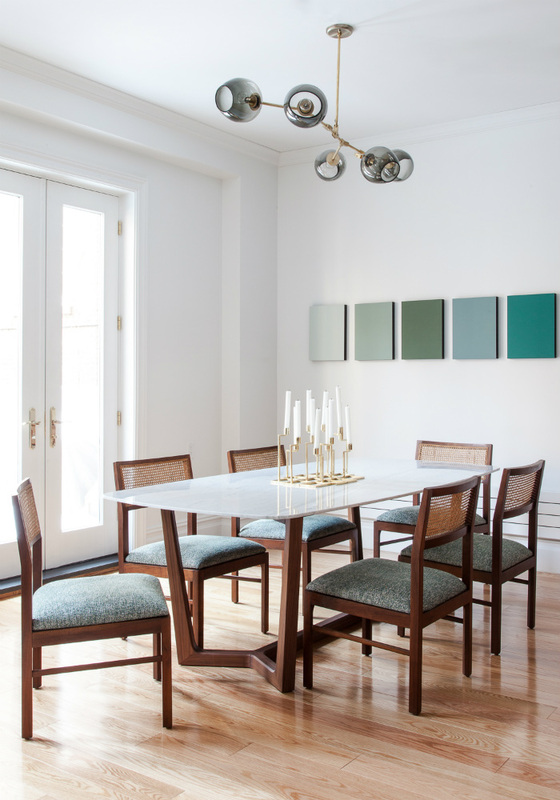 The marble and walnut dining table is matched with vintage dining chairs, reupholstered in a blue-green fabric that stays true to the chosen color palette that’s prominently on display. 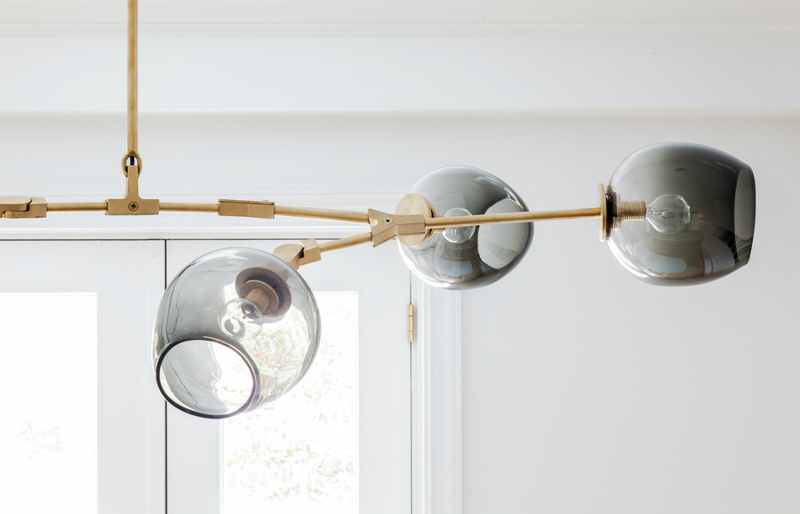 And what’s not to love about that custom-built chandelier, a bold piece that stands out against the zen space? 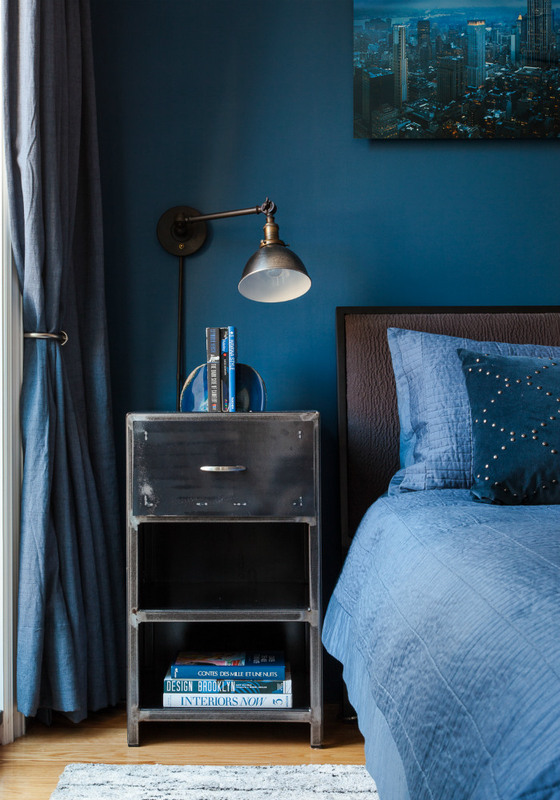 This bedroom looks like the bluest room of all, with different shades creating a layered and interesting space. 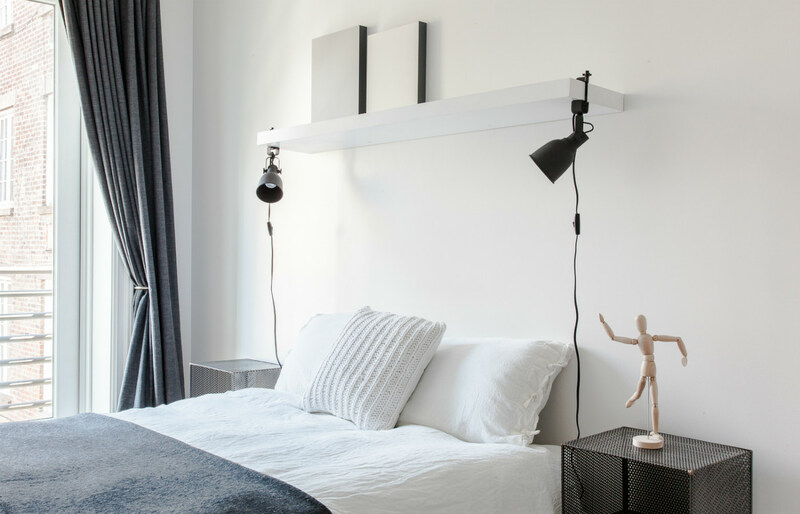 A second bedroom brings in more white and grey, and looks like it gets incredible light. Overall, this is a renovation that takes full advantage of color to create warm, relaxing spaces. 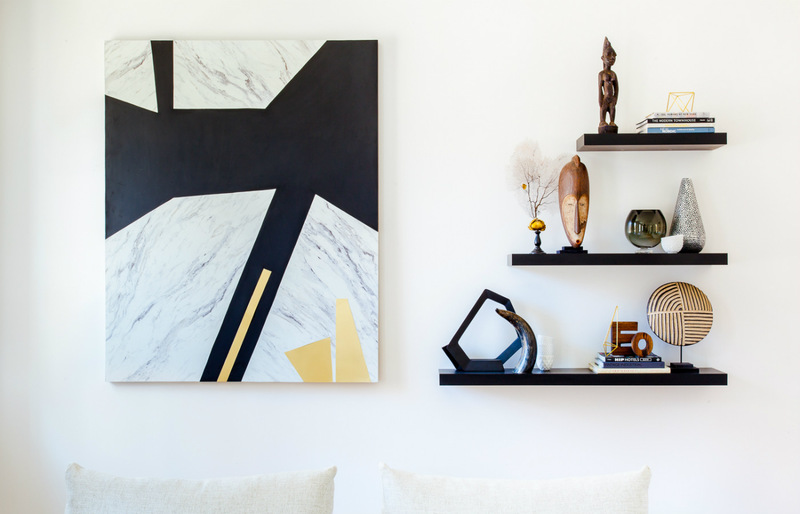 Within the hustle of New York City, what more could you want than a space like that? 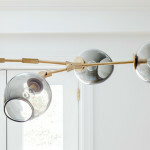 See more inventive design from the New Design Project here.